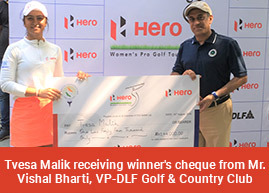 Gurgaon, March 20: Gursimar Badwal, who has won two of the last three events and has been the most consistent in the 2018 season, will begin as a big favourite for the sixth leg of the Hero Women’s Pro Golf Tour. Gursimar has not finished outside Top-5 this season and she also leads the Hero Order of Merit. The Rs. 8-lakh sixth leg coming in exactly a month after the fifth, will also see the return of Vani Kapoor, Amandeep Drall and Gaurika Bishnoi, who missed some of the earlier domestic events as they were playing in Australia. The trio missed the last three legs. While Vani won the first leg of the ongoing season, Amandeep and Gaurika, winner of the 2017 Hero Order of Merit, are still looking for their first win of 2018. The only notable star missing is Sharmila Nicollet, who played only the second leg, which she won. Since then she has been focusing on events outside India. She played in Australia and is now in China at the China LPGA. This year the first five events have produced four winners, with only Gursimar winning more than once. The others, Vani, Sharmila and Tvesa have won once each. Neha Tripathi, who has been a runner-up twice this season, will be looking to end her title drought. In the opening round at the Jack Nicklaus designed Classic Golf & Country Club, Gursimar, Vani and Smriti Mehra have been drawn in the second to last group while the last group to tee off will be Millie Saroha, Hita Prakash and Sonam Chugh. In the morning, Afshan Fatima and Khushi Khanijau go out first in a two-ball, followed by Suchitra Ramesh, Mehar Atwal and Siddhi Kapoor. The third group sees Priya Puri, amateur Sifat Sagoo and Tvesa Malik, while Ayesha Kapur, Trisha Sunil and Amandeep Drall are drawn in group four. Group five comprises Komal Chaudhary, Gaurika Bishnoi and Tavleen Batra, who will be followedby Neha Tripathi and amateurs Tanirika Singh and Ridhima Dilawari.